Joe Young has traveled back and forth between Kalamazoo and San Francisco and San Francisco and Baltimore for most of his life. This wanderlust has always been a part of Joe’s life. He is most at home not being at home—that is, he is most at home being somewhere else. This sense of home has driven Joe to hitchhike across the country and to drive drive-away cars to anywhere. Once, he died on the railroad tracks in Mexico, though the significance of this event is obscure. Now he is alive again and becoming more comfortable with being at home, as well as becoming more comfortable with himself. 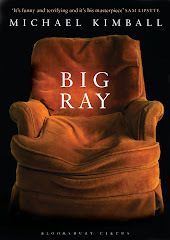 While at home, he writes about art and writes what he describes as tiny stories that pop out of his head with no preconceived notion attached to them. He likes the sustained, intense concentration that the tiny stories require and the white space that contains the tiny stories. He likes the miles that he has traveled and the way that that distance surrounds his life. Minas Konsolas was born in 1953 in a tiny, isolated, mountain village way up in the clouds called Olympos (the second “o” makes it different). In 1973, he was conscripted into the Greek army. In 1976, he got out of the Greek army and left Greece too. He went west to visit his sisters in Baltimore and stayed because it was cool. His perception of the world had changed and he preferred being an immigrant in the US rather than a foreigner in his own country. He is a bohemian on the run and believes that we are always searching for our home within ourselves. One of the ways that Minas search for himself is through painting, which he has done since he was 21 years old; it is a way to be with himself, to create something, and to record the tensions in his life. He never played the lyra when he was growing up on Olympos, but he does now, as a way to stay connected to Greece. Coming from a family of merchants, it is fitting that Minas now runs a boutique with his wonderful wife, Peggy Hoffman. In fact, it is because of this seemingly inherited trait that they met. One day, Minas had stepped out of his shop for a bit of fresh air, saw Peggy walking down the street, and thought that she was the freshest thing that he had ever seen. The fact that Peggy and Minas are from two different cultures means that they are still discovering new things about each other, which has kept their marriage fresh as well. Peggy Hoffman was born in Atlanta, but moved to Baltimore, which is where she mostly grew up, with her family when her father bought a bookbindery there. Unfortunately, this move led to her parents’ divorce, the discussions about which Peggy listened to through vents in the family house. If a divorce could be a good divorce, then this was one. It also helped that Peggy went to a high school where all the cool kids had divorced parents. Peggy’s adult life has also been split, though in another sense. Peggy used to work in the non-profit sector—everything from building homes for people to education and literacy; she was proud of her work, but miserable. Now she works in the for-profit sector, a boutique that she co-runs with her wonderful husband, Minas Konsolas. Peggy loves her life with Minas and the fact that they can run the boutique while also supporting the community of artists, writers, and performers who frequent the store’s upstairs gallery. If she has one regret, it is that she didn’t buy a headstone for her mother’s grave, though the reason for that regret is unresolved. Peggy has a beautiful voice, is skilled at palmistry and Tarot, and may yet become a witch. Emily Waters’ family came over to America on the Explorer, the ship after the Mayflower, but she wouldn’t have been born if her mother hadn’t come to Baltimore on an internship and met her father. Emily has lived in the same neighborhood, same house (with her creative family), and same bedroom for her entire life. Her love of photography started at age 7 when she became obsessed with shooting Polaroid photos and watching them develop. By age 10, she was stealing her mother’s camera to take photos whenever her mother was out of the house. At age 12, she was given her first digital camera. At age 15, her mother bought Emily her first manual camera. Switching from a digital camera to a manual one was a significant change for Emily and this is how she fell in love with the process of transformation. 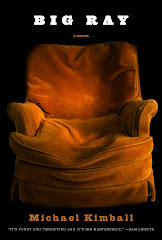 She loves the smell of dark room chemicals and working over her photographs so that she can watch the transformation. It is this same instinct that makes her love fashion photography, especially photography girls who aren’t normally considered pretty; she likes to dress up her models in costumes, bright make up and wigs until they too have been transformed. Ann Makowski grew up as a Navy brat, attended 11 different schools in 8 different cities, and now lives in Alexandria, not far from where she was born, Norfolk. She liked moving so much, though she has now lived in the same place for 20 years, probably since her mother has stopped coming into her bedroom and telling her it was time to move. One benefit to living in all of these places is that she can talk to anybody, which in turn has made her good with words, which in turn has led to a job that she loves, putting words on 3D signs. Ann has never married, probably because she would never date anybody who would date her. This may be tied to her love of food and her weight issues, which she sees as a kind of physical and emotional shield—protective, defensive. She continues to lose weight, though, and to embrace the world around her. David Kendall grew up in Baltimore, left, and came back. From an early age, he wrote children’s stories for his brothers and sisters, which led to him being a painter and a poet as an adult. It was also as an adult that David first left his body, this after he was in a car accident. He didn’t want to feel the pain, so he floated up above the intersection. His floating body was outlined in white ink and he carried a briefcase. He still leaves his body when he is feeling at ease and secure, and sometimes he encounters his mother this way. In fact, it was his mother who introduced him to reincarnation and David was, among other people, a healer for the Czar’s family in the 18th century. He has also seen ghosts and a UFO with blue-skinned aliens. David knows things about the world that most people will never recognize. Albert Donnay has four passports—US, Canada, Germany, Israel—which makes him a citizen of the world, the earth his home. This being the case, and in an effort to care for the world, he rides his bicycle wherever he can; he used to drive a Zodiac boat for Greenpeace; and, he founded Nuclear Free America. He continues to focus his care for the world and people through his research on multiple chemical sensitivity, which has provided new explanations for the death of Poe, Van Gogh, and other historical figures. He will be the last one in the family with a PhD, which his father has been waiting for for years, and which will lead to a greater understanding of people and the world, which we have all been waiting for. This is me interviewing Albert Donnay before I started writing the postcard. As you can see by the generous expression on his face, Albert is quite an interesting person. Also, my right arm, though I didn't know it then, was getting sunburned. This is the postcard itself. It isn't always easy to write somebody's life story, to honor their details, while the person is watching you write their life story. Gail Gerlach was born in 1958 in New Haven, CT. She moved to Baltimore with a boyfriend, who she later dumped, but stayed in Baltimore anyway. She became an ER nurse. In fact, ever since she was a little girl, she knew that she wanted to be a nurse. At age 7, she became a Pinkie (Candy Striper) at the hospital near where she grew up. Gail loves her job because she makes a difference in people’s lives by taking care of them. There is a downside to her job, though. Having seen so many terrible accidents at the hospital, Gail often worries that terrible things have happened to the people she loves, even if they are just a few minutes late coming home. Now 50, Gail loves her age, her family, and the fact that she has a good boyfriend. Kristina Green was born in Baltimore in 1988 to a creative family. This led to Kristina’s early love of music, art, and theater, which led to her attending Patapsco, a magnet school for creative students. She’s now in art school at CCBD where she studies costume, figure drawings, and portraits. She isn’t sure what she wants to do with her life yet, but she continues to search for her life’s purpose through self-portraits and costuming and going to conventions where she portrays other people. She will eventually find herself in one of these self-portraits, which will be admired by others for their generosity and their understanding of the human condition. Joe Thompson was born in 1953 in Jamestown, NY. He was put up for adoption, but his mother changed her mind. She changed her mind again and he was adopted by his grandparents. Unfortunately, they died one year later and he went back to his mother, who was out of the hospital at this time. When Joe realized that she was crazy, he ran away to the theater, where the theater owner took him in (he later learned that he was one of his family’s bastards). His love of the theater grew from there and became his safe place. Luckily, this didn’t keep him from meeting his wife, even though they never would have talked to each other in high school. He’s now an art teacher, actor, writer, director, father of the great Leslie and the wonderful Martin, who is developing his own love of the theater and fulfilling his father’s meaning of life: To create. Not all of the postcard life stories will be made public. If a person doesn't want their life story to be made public, then I will simply send them the postcard and it will be just for them. I'm saying this, in part, just to make it explicit. 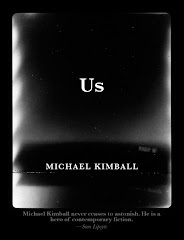 The other part is that I want there to be some chronology to the project, so I'm going to number the life stories. The first 23 I wrote were at the Transmodern in Baltimore and most of these are with their people. I simply gave each person their postcard and they walked away with it. At the time, I had no thought to make this a bigger project and didn't attempt to document it in any way. Now I have the text for a few of these life stories, though, mostly through the miracles of social networking. Of course, if Billie, Elaine, Max, C., Devon, Lisa, Jennifer, Elisabeth, Moira, Cooper, Karim, Sara, Jonathon, Rob, Maura, Will, Thomas, Russell, Michael, a second Sara, or Abbey still have their postcard life story and want to be included in the public part of the project, then please get back in touch. Lynne Kruger loves to travel and to make things. As a little girl, she always knew that she wanted to go to California, so she took a cross-country trip with a girlfriend, but was abandoned in Denver. She later hitchhiked to California, since she never made it there with her girlfriend. Eventually, she traveled back to Maryland, where she was born, and she now works to travel. She has traveled all over the world, but her kids are her life now, Lawson and Maxwell. She wishes that her boys were nicer to her, but she is still happy that she made them. She likes making things, especially crafts. She doesn’t care what the materials are as long as she is making something. It is this same instinct that led her to take her love of dogs and become a dog breeder, making dogs for other people. In fact, by way of all of this making, she has also made a good life for herself—better than she realizes. 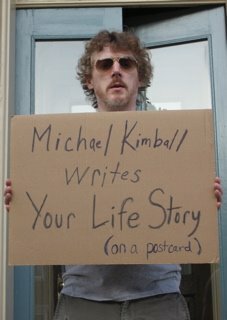 I will be doing Michael Kimball Writes Your Life Story (on a postcard) at HONFEST on the sidewalk in front of Minas this Saturday and Sunday from noon-ish to 3-ish. That's 815 W. 36th Street (The Avenue) in Baltimore. 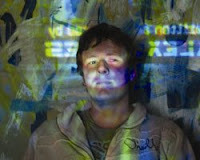 Bart O'Reilly was born in 1975 in Dublin, grew up among musicians, and always loved to draw. At 16, a chance encounter with an older artist led him to art school, which in turn led him to the US (though this was on a break from art school). He was working as an ice cream man on the boardwalk in Ocean City when he accidentally met the woman who would become his wife. Meaghan and Bart fell in love and she moved back to Dublin with him. Unfortunately, Meaghan did not like Ireland and Bart had to choose between his love and his country. He chose his love, the result of which is their 9-month-old son, Eoin, who is Bart’s personal culmination of his love for Meaghan and for Ireland. My friend Adam Robinson was curating an art festival in Baltimore and he asked me if I wanted to participate. I had never done anything like that, but I told him that I could write people’s life stories. I thought it would be fun and funny and that I would write on the backs of a few postcards and that would be it. The first postcard I wrote was for Bart O’Reilly, a painter, who quit art school in Dublin to work as an ice cream man in Ocean City, which is how he met the woman who became his wife (see Bart’s life story posted here). When I finished the postcard and looked up, a line had formed. For the rest of the night, I interviewed dozens of people and wrote each person’s life story on the back of the postcard. I did this for four hours straight without getting up out of the chair that I was sitting in. I was completely exhausted by the end. My mind was racing with the details of people’s lives and the hope that I had done their various stories justice in the space of a postcard. I was astounded by what people told me, the secrets and the difficulties, the pain and wonder and hope that they revealed. People told me about being in jail, about not being able to have children (and only wanting children because of the infertility), about having too many boyfriends, about computer hacking, about keeping it a secret that they like doing homework, about meeting their future wife while working abroad selling ice cream at a seaside boardwalk, about moving to a city because they liked a particular diner, about leaving their birth country when they were 5 years old and continuing to try to escape wherever they lived, about saying their favorite color is green even though it isn’t, and about feeling responsible for their adopted brother being institutionalized. That’s how this started. If you would like me to write your life story (on a postcard)—and trust me, I want to—please get in touch. Tell me your name, age, where you were born, where you have lived, what you do (jobs and hobbies) or what you study (if in school) or what you want to do with your life. Tell me about any important events in your life, any life changing decisions, any strange things that have happened to you, anything that makes you particularly you. I will follow up with questions, then write up your life story, and mail you the postcard. You will be able to put it up on your refrigerator with a magnet if you want.